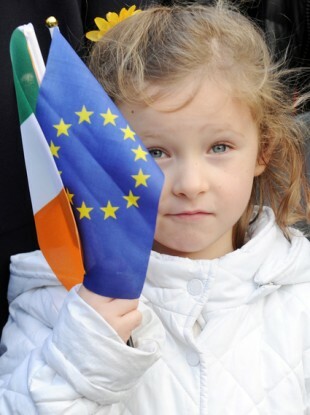 SEVEN OUT OF 10 Irish voters think Ireland should stay in the European Union, even if the Brexit deal between the EU and the UK is bad for Ireland. That’s according to an opinion poll conducted for an RTÉ One documentary. It also found that four out of five Irish voters (82%) believe the Government should be tougher in its dealings with the EU over Brexit. EU’s chief negotiator Michel Barnier will represent Irish interests when negotiations on Brexit start later this year. When asked whether voters trusted parties to the upcoming Brexit negotiations to protect Irish interests, 75% of voters trust our own Government to do so and 72% the EU’s negotiating team, while only 43% trust the British Government. One of the top three priorities identified by Barnier’s team is the border between the North and the Republic of Ireland. The threat of a hard border has led to some discussion of other outcomes, including a united Ireland. When asked if they would favour a united Ireland if it made sense following a Brexit deal, the RTÉ poll found that 74% would favour a 32-county republic, while 21% are against it. Barnier’s team have a two-year window in which to conclude the Brexit negotiations and agree terms with the British Government. When asked if the Irish Government should hold a referendum on the outcome of the Brexit negotiations, 53% of respondents to the RTÉ survey said it should. However overall the survey showed that voters see our future within the EU, with 71% agreeing that Ireland should stay in the EU, even if the outcome of the Brexit negotiations is bad for the country. Voters also want to see a closer-knit Europe after Britain leaves the Union, with 67% of respondents saying that they want to see further EU integration once a Brexit deal has been agreed. The survey of 1,000 adults was conducted by RedC between the 8 and 11 May. They were asked a number of questions on the challenges now faced by Ireland and how they believe our Government should now react. The poll was conducted as part of a new, authored documentary, Brexit, Trump and Us, where economist David McWilliams explores the events that have left us facing these tough decisions. Brexit, Trump and Us will be shown on RTÉ One tonight at 9:35pm. Email “Most Irish people want to stay in the EU even if Brexit deal is bad for us”. Feedback on “Most Irish people want to stay in the EU even if Brexit deal is bad for us”.